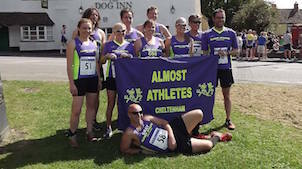 The Almost Athletes members who were voted "Runner of the Month" in previous years. Welcome to Runner of the Month for April. Our first worthy winner is Lorraine Taylor. Having got her half time under 2 hours with a 1.55 at Stroud in October, Lorraine has been training very hard and has stepped up her distances to begin competing at the daunting 20mile distance. At the Berkeley 20 she recorded an excellent 3hrs 15mins but within 2 weeks at the Gloucester 20 with its notorious 3 laps and “that hill”, she took her time down to a brilliant 3.02. Very impressive indeed. Lorraine is a brilliant supporter too of her club team-mates, cheering them on at races and events. Well done Lorraine! Our second Runner of the Month is Rich Walklate. Rich goes about his running very quietly but regularly turns in some amazing performances. At the Manchester Marathon on Sunday he stormed to a new marathon PB of 3hrs 3mins, a massive 22 minute improvement on his previous best. Far from the tarmac of Manchester, some may not be aware too that Rich “conquered” the Everest Marathon last year, a marvellous achievement. Rich gives a lot back to the running community too where at Cheltenham parkrun he is a valued member of the core team and with Almosts he has established a regular off-roading community throughout the winter where he has been solely responsible for the UK’s sales spike of head-torches. Good work Rich. Our final Runner of the Month for April is Hattie Jenkins. Hattie is one of our quickest ladies and has had a storming season so far. At the Berkeley 20m she was first lady home in very tough conditions in an amazing time of 2 hours 15mins, beating her nearest rival by nearly 5 minutes. At the Forest of Dean Half on Saturday she flew around another tough course in just 1.31 for 3rd lady overall and was part of the victorious 1st placed Ladies team for the club. This all despite a recent injury which she has determinedly fought through and has set herself up for the VLM a week on Sunday. But beware, she is also our legendary Almost's “Photo Bomber”. Good luck for London Hattie ! Our first Runner of the Month for February is Catherine Daly. Cat has been a very consistent runner over her time with Almosts & really enjoys her racing & training, supporting her fellow club mates with lots of encouragement and smiles. We particularly recognise Cat as our ROTM for her recent brilliant run of a string of PBs. She achieved this first at the very tough 20mile distance at Bramley, taking down dad Mike in the closing stages. Then in Torremolinos, no mean feat to get a PB on that weekend!, she knocked 5 minutes off her previous best to hit the 1.50 mark for the half marathon. Then at parkrun she turned in 23.36 last weekend. Great stuff Cat and keep up the good work, ….and beating your dad.